I have never made scones, ever. And to be perfectly honest, I have never even eaten a scone – even after living in England. So this was a total shot in the dark. That said, I was worried about the temp and time in the recipe – it did not make sense to me. 400 degrees for 40 minutes. I get that it was a really wet, shaggy dough, and a bit of a mess but …. To take an idea from K-9 search and rescue – Trust your dog – well, I need to … Trust my instincts. Preheat oven to 400 degrees. Line a baking sheet with parchment paper. In the bowl of a stand mixer fitted with the paddle attachment, combine flour, butter, sugar, baking powder, and salt. Mix at low speed until the mixture resembles wet sand. In a separate bowl, whisk together 3/4 cup cream, 2 eggs, lemon zest, and vanilla. Add the cream mixture to the flour mixture, and beat on low speed until just incorporated. Turn out onto a lightly floured work surface, and form into a flat disk, about 8 inches across and 1 1/2 inches thick. Cut into 8 wedges and transfer to prepared baking sheet. In a small bowl, whisk together remaining egg and 3 Tbs cream to make an egg wash. Brush scones with egg wash and sprinkle with sugar. bake until the tops are golden brown and firm 40 to 50 minutes. Notes: Okay, I had problems with this recipe (as noted above). Just 30 minutes tops, unless you want the bottom to burn. Needs more lemon; I’m thinking a lemon & confectioners’ sugar glaze – that would work. At least for me. I would also use raw sugar for the top – a little more crunchy. That would be good. Guess scones go thorough the baking powder. I need to learn the science behind that, but sometimes it’s just more fun not to. With the scones I baked 30 minutes. They were lovely. Lightly brown, crunchy outside, but light inside. I could get used to that for breakfast. 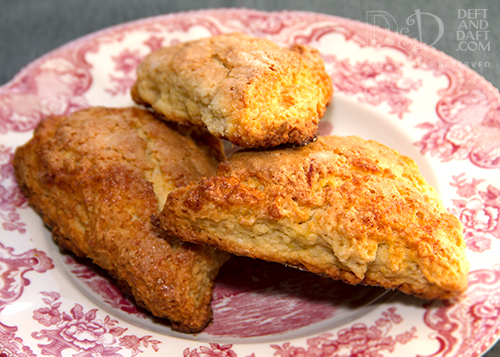 Next in scones: Brown Sugar Pecan Scones. I already have the dry measured out in a zip top bag for when I’m in the mood to go another round. This time the recipe seems a bit more reasonable concerning time and temp. And I will also consult my Baking Illustrated cookbook from America’s Test Kitchen to see what they do. It’s hard, sometimes, when you’ve never made a particular thing before to trust yourself, but this is a lesson learned. I have good instincts in cooking and baking, so I need to trust myself more.